Our recent paper (together with Ingmar Weber and Sonia Dal Cin) studying Romantic Relationship Breakups on Twitter was accepted at the 6th International Conference on Social Informatics (SocInfo 2014). In the paper, we identified pairs of Twitter users who were in a romantic relationship and studied various psychological processes surrounding relationship dissolution. 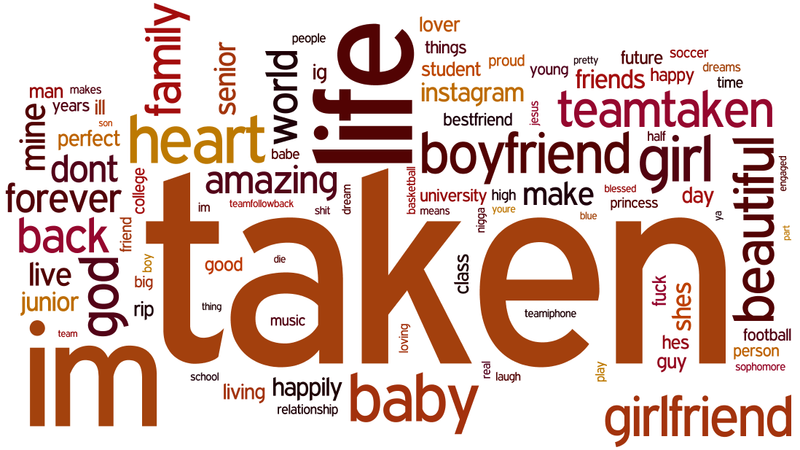 Users were identified to be in a relationship based on their profile description. The Figure below shows a user (@itw85055) declaring that he is in a relationship with @zzs46289 (These are dummy profiles, just for illustration). Example of a Twitter user in a relationship. The profile description on the bottom left shows that the user is in a relationship with the user @zzs46289. We then tracked such couples on Twitter for over 6 months and looked for users who removed the mentions of other users in their profile, indicating a tentative breakup. We then validated this data using manual labels from humans using Crowdflower.com. Why would we want to study relationships on Twitter? – Good question! There is a variety of reasons. 1. Openly accessible data and ease of data collection on a large scale (unlike, say, other social networks like Facebook). 2. The main problem with existing approaches from psychological studies is that all of them are based on surveys conducted after the breakup takes place (based on recollection). Our data would have less self-reporting bias in that aspect, as we can have a timely collection around the moment of break-up. 3. Having social context in the form of network information. 4. It was an interesting challenge to see if we can use public data from a social-media platform to analyze human relationships and human emotions. This kind of a study with large scale publicly available data would open new possibilities in the area of psychological studies, we assume. 1. No control over data collection mechanisms, and hence the possibility of noise and the lack of well-defined variables. 2. Difficulties in observing psychological variables. 3. Limited power to determine causal links. 4. Privacy concerns. On our part, we made sure that we do not single out any users and only looked at aggregate information. Using crowd-sourcing and publicly available data, we validate that it is possible to identify a large set of relationship breakups on Twitter. spirituality, but also (iii) curse life for what has happened. 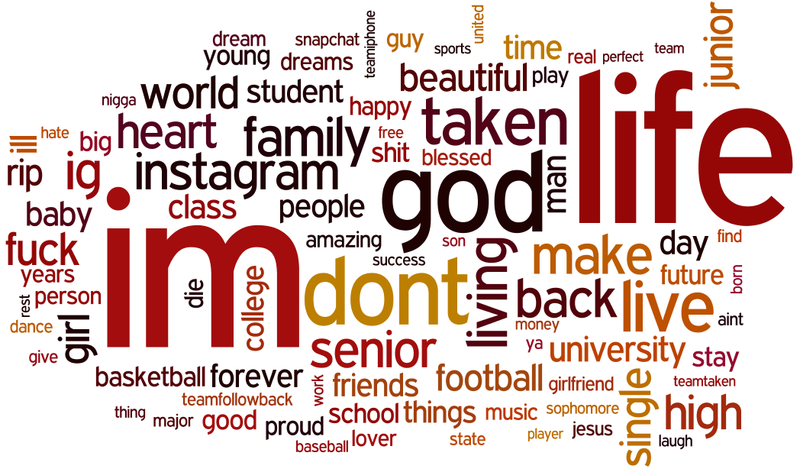 Word cloud of the profile descriptions before breakup, at the beginning of our study. 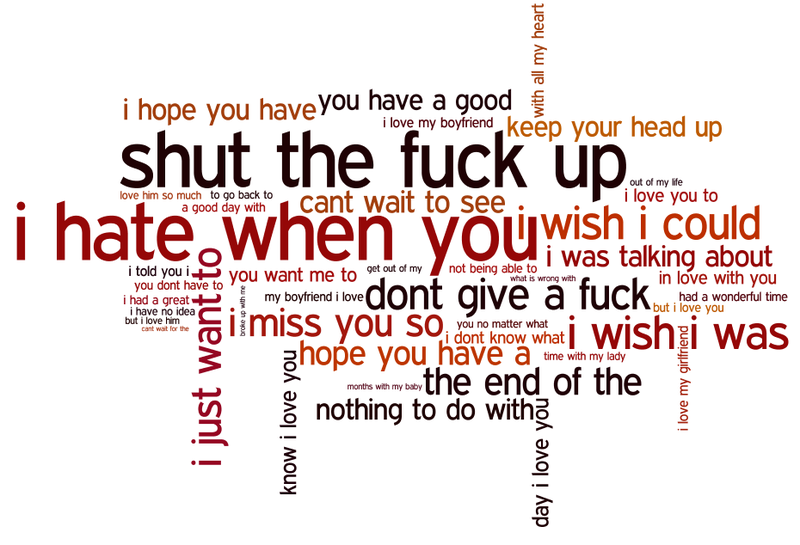 Word cloud of the 4-grams from messages exchanged between users after breakup. We observe that as the breakup approaches, such as a decrease in the fraction of messages to the partner, and an increase in the fraction of messages to other users. The figures below shows the change in communication patterns before and after breakup. We looked at the 4-grams (groups of 4 words) of messages the users exchanged before they breakup and the same after they breakup. We can see a clear change in the communication, with surprisingly a lot of public fighting and insulting after the breakup. 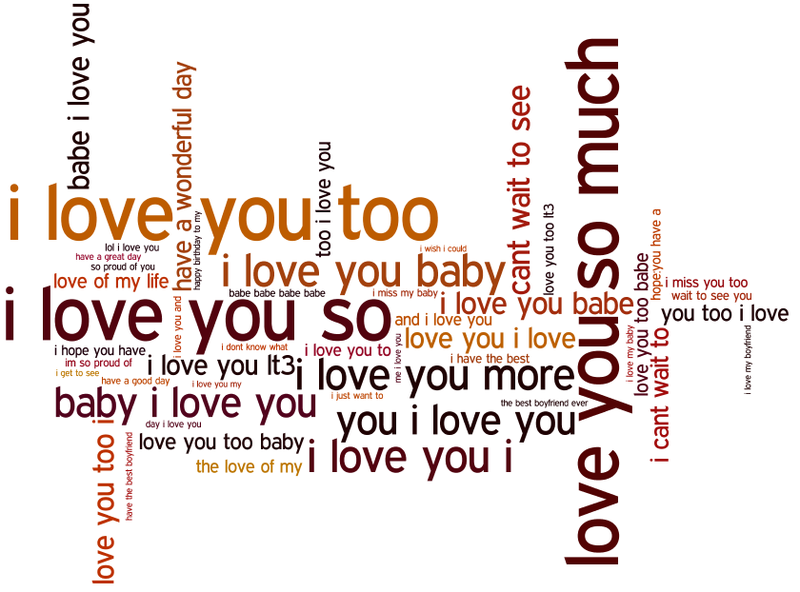 Word cloud of the 4-grams from messages exchanged between users before breakup. We observe batch un-friending and being un-friended as indicated by the sudden loss of both 15-20 Twitter friends (who you follow) and followers (who follows you). Length of relationships (in weeks) for pairs of users who breakup (blue) vs. those who dont breakup (red). We confirm that couples who breakup tend to be “fresher” in terms of how long they have been in a relationship when compared to couples that do not breakup. The length of the relationship was obtained as a proxy from when the pair first had messaged each other on Twitter. The plot below shows the fraction of pairs in our dataset along with the length of the relationship in weeks. We see clearly that most of the couples who breakup have a shorter relationship length. We observe an increased usage of terms indicating sadness after the breakup compared to couples that do not breakup. We find a higher level of usage of term indicating sadness for likely “rejectees” compared to “rejectors”, both before and after the breakup. Communication asymmetries, related to one-sided “stonewalling”, are more likely for couples who will breakup. There are higher levels of post-breakup communication for couples who had higher pre-breakup levels of interaction. For more details and discussion on our findings, please have a look at our paper here. Please let us know if there are any questions/comments.